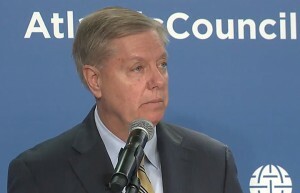 Republican presidential candidate U.S. Sen. Lindsey Graham will return to Iowa on Friday where he will hold a “No Nukes for Iran” town hall meeting at the West Des Moines Marriott in Concord Rooms C & D. The event will begin at 1:30 p.m. This will be the first stop of the tour since it launched last week with special guests Senator McCain and Senator Lieberman in New York City. Graham has been at the forefront of the fight to stop the Obama Administration’s bad nuclear deal with Iran and the “No Nukes for Iran” Tour is the latest in those efforts. The “No Nukes for Iran” Tour is a nation-wide tour aimed at encouraging members of Congress to vote against the bad deal negotiated by the Obama Administration and will take place over the next 50 days or until Congress votes on the deal. The tour is set to visit states such as New Hampshire, Colorado, Florida, Massachusetts, Pennsylvania, Nevada, Minnesota, and more.